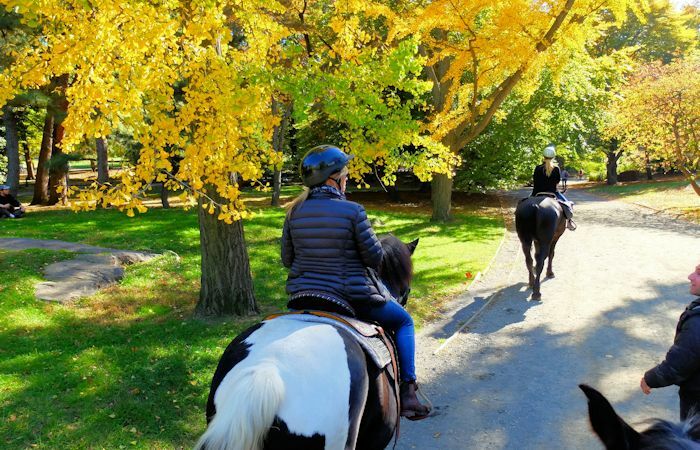 Horseback riding in Central Park is a relaxing way to discover the park. Explore your surroundings comfortably astride a horse during a one or two hour hack over the park’s bridle paths. You ride the horse independently and the guide will ride in front of you on the paths, leading you through the park. Whether you are a seasoned equestrian or it is your first time on a horse, this is a unique experience for all. 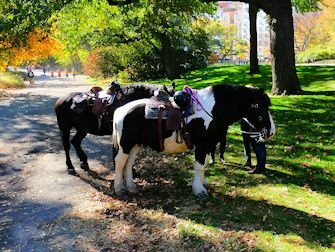 You meet your guide and horse at Tavern on the Green in Central Park. The ride is with a small group and starts with the guide distributing your helmet and giving a short explanation of how to handle and steer your horse. Then, off you go! In Central Park, a light trot is the fastest pace permitted so it’s a safe, relaxing activity. The route varies per ride, depending on the conditions on the day. There aren’t many riders in Central Park, so it’s also a special thing for passers by to see! During my ride I was often waved to and people wanted to take photos of the horses. 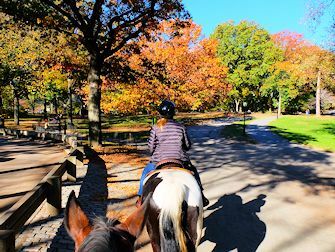 If you go horseback riding in Central Park, you really get the feeling that you are doing something exclusive. Eric’s Tip: I had never been on a horse before I did this and I had no idea what to expect. I’ll admit, I was a little nervous! I walk or cycle almost on a daily basis in Central Park, or I cross it with a taxi, but this was a whole new experience. I was really surprised that I could have such a relaxing experience on such a huge animal. Are you a horse fan? 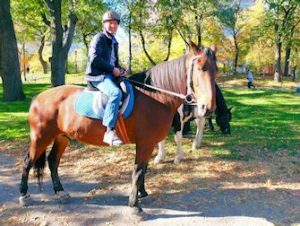 Then you will definitely enjoy horsebackriding in Central Park. The guide will tell you everything about the horses: their breed and how they are looked after. Are you, just like me, inexperienced? Then what could be better than learning to ride a horse in Central Park? I personally found this a fantastic experience, it was definitely not the last time I will do this ride. This trip would also make a great (romantic) gift to surprise a loved one. After purchase, you will receive a voucher that you can either print and bring with you or show it as a mobile ticket on your smartphone.